Jalandhar: Lovely Professional University hosted USHA Deaf India Cricket League (ICL) Matches Series- 2018 at LPU Playgrounds. 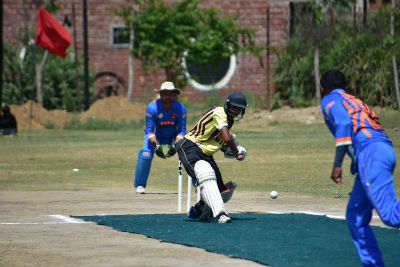 The enchanting series was organized by All India Cricket Association for the Deaf (AICAD) and Deaf Cricket Federation, Punjab. Participating team ‘Chenab XI’ lifted the sparkling Usha Deaf ICL 2018 Trophy along with cash prize of Rs One Lakh. Cricketer Aman declared ‘Player of the Tournament’ for scoring 174 Runs & taking 14 Wickets and was awarded with ‘Datsun Ready Go Car’. The Final Match of the series was graced by the exclusive presence of the Chief Commissioner Income Tax (Punjab) Sh Vinay Kumar Jha; Commissioner GST Shri Ashutosh Bhareywal; Chairman Lovely Group Shri Ramesh Mittal, Deputy Commissioner GST Shri Lakshey Gupta and more. The Honourable guests handed over the cash prizes and keys of the car to the respective winners. For this 3rd edition of Usha Deaf ICL 2018, 15 matches were held among participating teams including Satluj XI, Ravi XI, Chenab XI, Beas XI, Jhelum XI, AICAD XI, Silent Heroes XI, Deaf Lions XI and more. Many of these 144 national and international players have also represented India as part of the Indian Deaf cricket team for Deaf Cricket World Cup, T-20 and in one day format matches. Illustrative, from adopting 20 nearby villages, nurturing spinal cord injury affected students to holding various blood donation camps and free medical check-ups; Lovely Professional University (LPU) keeps up various efforts through its CSR initiatives for bringing a sea-change in the society. Following the same passion, LPU hosted this three-day ‘Deaf & Dumb’ cricket-matches series at LPU Playground.